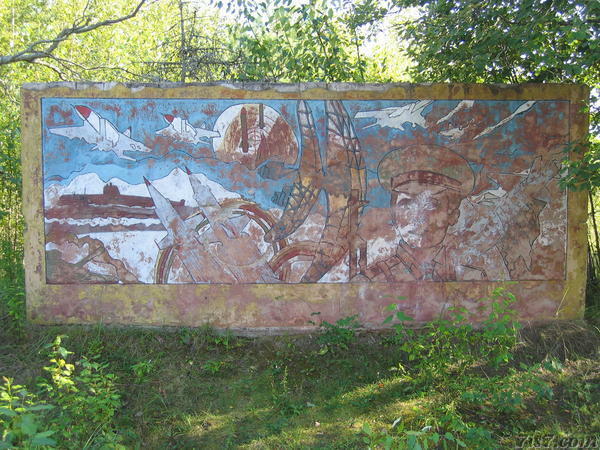 A Soviet mural stood in the Dejevo base near Karujärve, the largest former Soviet military base on Saaremaa. Looking at the mural I got the impression that it was drawn by a child. In May 2011 ERR reported that the Dejevo base was being leveled1. In June 2012 we visited the base again, and indeed all the above ground buildings have been torn down leaving us with missile launching pads, ramps for surface to air missiles, and some bunkers. As for the mural, it fell over. It has broken into several large pieces with the front side facing down. Location: 58°23'57"N 22°12'5"E on: Google Maps, OpenStreetMap, Maa Amet.